Hello Beauties! Along with Kate Spade and Dior, Burberry is one of my favourite designers. I love how elegant and timeless their pieces are, making them worth every penny in my opinion. So imagine how thrilled I was to receive this adorable Burberry fragrance travel set as an early Christmas present this year! The set comes packaged in Burberry's signature packaging, which instantly drew me to the set. 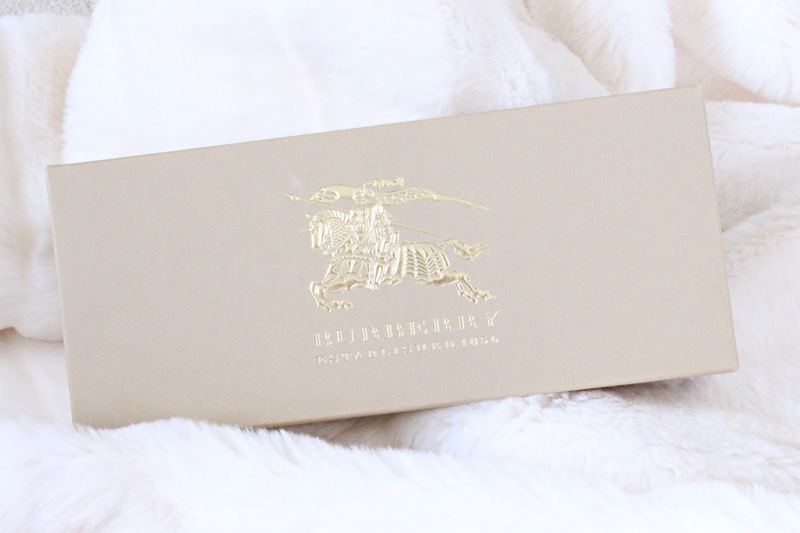 I adore the Burberry packaging as it's understated and sophisticated which makes it seem all the more luxurious. I'm such a hoarder of pretty packaging, so I'll definitely be keeping this box to use as storage/decoration in my bedroom. 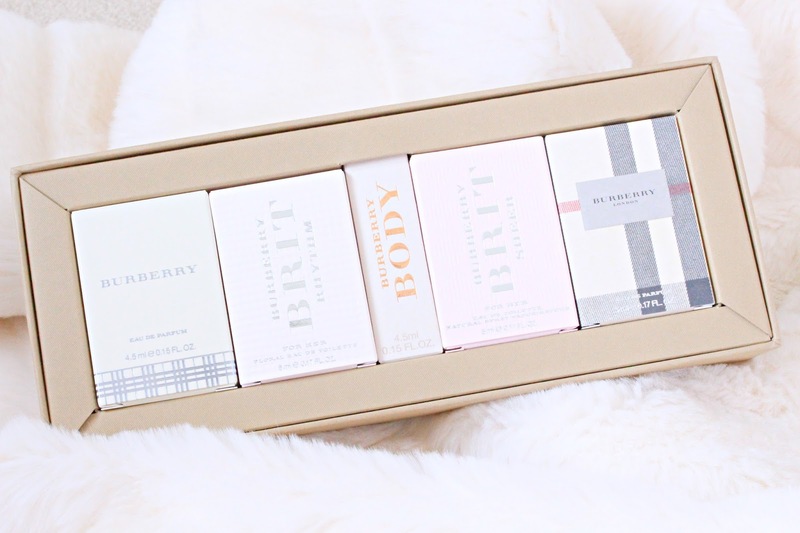 Inside the box, the set contains five of Burberry's most popular fragrances, making this set a great introduction into the brands fragrance library. First up in the line up is the original scent from the brand. Described as a fruity fragrance with top notes of blackcurrant and green apple. Combined with heart notes of cedar wood, jasmine, moss and sandalwood, the fragrance has a rich and sensual tone. This one is probably my least favourite as it's a little mature for me personally, but if you like deep and warm scents then you'll definitely love this one! Second up is Burberry Brit Rhythm, one of the brand's takes on the original Burberry Brit fragrance. Brit Rhythm is described as a sensual, floral fragrance with a fruity twist, and is my favourite of the five. The fragrance has fresh top notes of orchard fruit, sicilian lemon and orange, which open up to an intoxicating heard of Egyptian jasmine, lotus blossom and lilac, making this a gorgeously fun and young fragrance. The cute pink bottle doesn't hurt either! In the middle of the set you have Burberry Body, which I think has the most unique packaging with its copper bullet shaped bottle. Burberry Body is described as a sensual, feminine fragrance with an eclectic combination of refined ingredients. With top notes of fresh green absinthe, illuminating peach and delicate freesia, aling with floral heart notes and base notes of creamy vanilla, amber and musk, this is one of my favourite fragrances from the set. 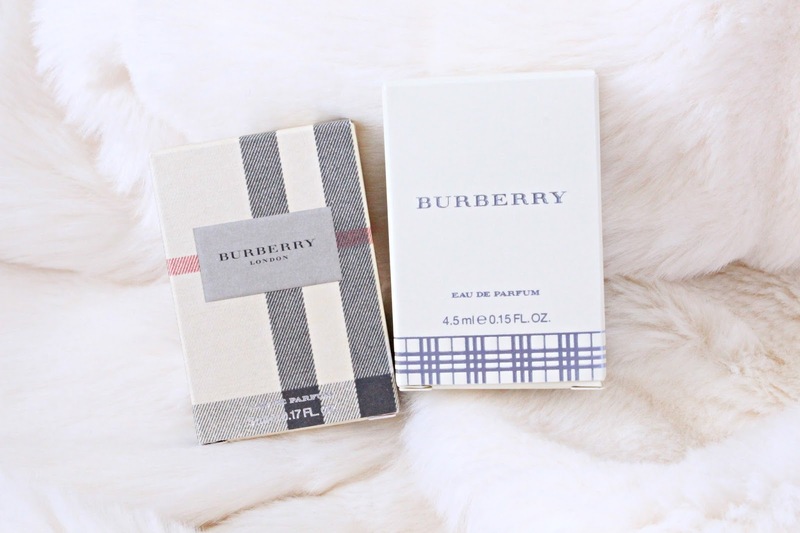 The set also contains Burberry Brit Sheer, another take of the infamous Burberry Brit fragrance. Brit Sheer is the more youthful of the two included in the set, and definitely the more delicate of the two. The fragrance has a refreshing scent to it with top notes of lychee, yuzu, pineapple leaves and mandarin, heart notes of peony and peach blossom which add a soft, floral scent and a sheer veil of white milk and blond wood to gently balance the fragrance. Lastly, the set also includes Burberry London, one of Burberrys more classic fragrances with its house check printed bottle. This floral-fresh scent has gentle top notes of rose and honeysuckle, deep heart notes of tiare flower and jasmine with a hint of fresh clementine zest, along with base notes of sandalwood and must to add a subtle warmth to the fragrance. After researching all of the different notes included within each of the Burberry fragrances within the set, it's no wonder I'm such a fan. I love any fresh and floral fragrances (Jo Malone Wild Bluebell is my all time favourite) and I'll definitely be keeping a few of these in my handbag and travel wash bags for spritzing on the go! The set is a travel exclusive and something only available from World Duty Free, so if you're lucky enough to be jetting off anywhere exotic in the upcoming months, make sure you take a look on your pre-flight shopping spree. some of my fav perfumes are in this set! How lucky are you :D merry xmas hun!